A design for a gas station made to look like a lighthouse. 1928. Invented by Robert E. Smith. 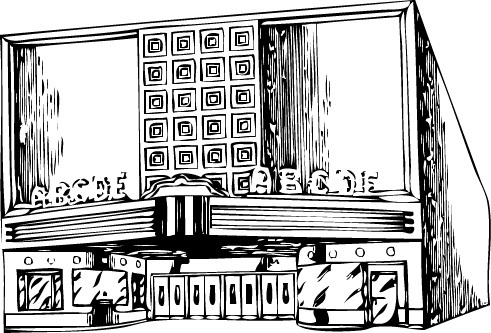 A design for a movie theater front. Victor A. Rigaumont, 1951. A wood dog toy with a tongue depressor nose. 1920. Invented by Richard Edward Humbert. A wheeled toy which will, while in use, give off pleasing musical sounds. Prior to use reservoir 20 is filled with water. Due to the mobility of this fluid, the air issuing from vent 18 will produce a warbling sound. Liquid in the reservoir will intermittently be discharged in small volumes through aperture 23, thereby adding an attractive feature to the toy. 1924. Invented by H. E. Boedecker. A design for a child's train by Tinker Toy inventor and founder Charles Hamilton Pajeau. 1924. Invented by Charles Hamilton Pajeau. A running rabbit toy. 1924. Invented by J. Villani. A toy airplane water pistol. Perfect for swooping in and shooting your sister from behind. 1952. Invented by William R. McLain. A three-barrelled, pump action water gun. 1950. Invented by Athan Bicos. A loopy-legged toy walking dog. 1953. Invented by Leon H. Kramer.